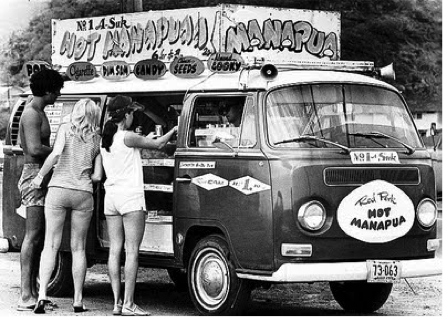 Hawaii has a lush history of meals on wheels starting back in the 1970’s with the introduction of the Manapua Man. Although manapua (traditionally known as cha ciu bao, steamed bun filled with pork) was the obvious top seller, the best Manapua Men sold fried noodles, pork hash, hot dogs, burgers, dumplings, canned juice and even candy. Just like the Ice Cream Man with his distinct ditty on loud speaker, the Manapua Man would blast his song bringing all the locals to the streets. Nowadays the once unavoidable Manapua Man, that drove through your street four to five times a day, is found in small scattered neighborhoods. The ebb and flow of the restaurant industry has seen a revival of The Food Truck. The large overheads and production costs that would cripple small businesses just starting out don’t affect food trucks like they do traditional venues. Throw in that the owner is the chef/sous chef/cashier/prep/waiter clearly expenses are a fraction of what they would be at a restaurant. Hawaii’s perfect weather, cultured people and big stomachs create a perfect platform for food trucks (and food in general). 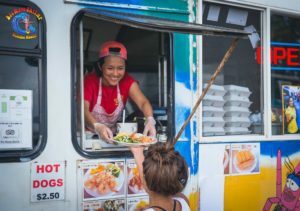 South of O’ahu offers you “Eat The Street” once a month where over 40 food trucks come together to give you a smorgasbord of ono kine grinds. Of course, on the North Shore food trucks are part of the normal scenery; most notably your very own – Big Wave Shrimp! With lots of tables, shade and calming music to add to the ambience, we are sure to make your dining experience one to remember. We are prepared to “wow” you with our Hawaiian style cooking along with your favorite local beverages and ono shave ice. Hele Mai, come dine with us! We promise, you’ll be glad you did! 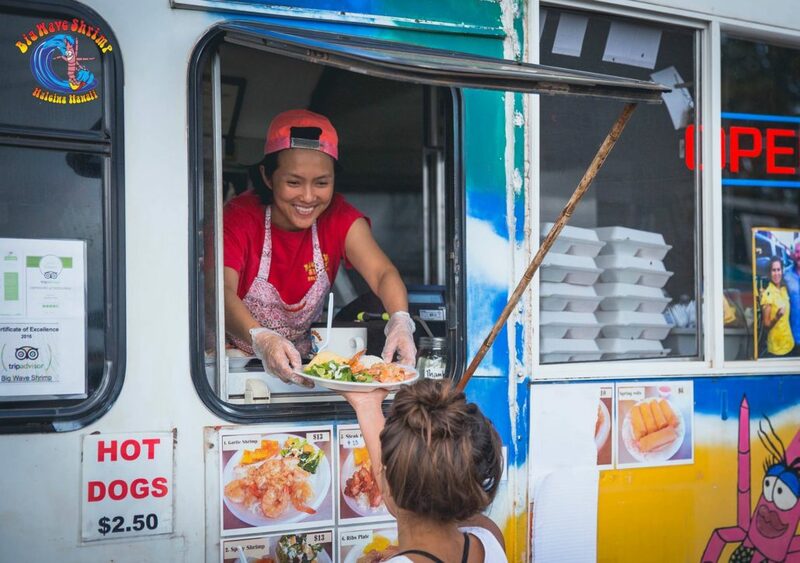 Whether you’re looking for shrimp plates, steak plates, or ono deserts, you’ll be able to find exactly what you’re looking for as there are over one thousand food trucks scattered throughout the island.